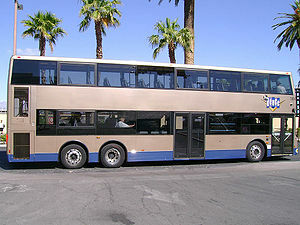 This route runs on Las Vegas Blvd exclusively with double deck buses. Premium fare/pass applies on this route. Fares can either be paid onboard or at a ticket vending machine at selected stops (ticket must be swiped at the farebox when boarding). The Deuce serves nearly every hotel/casino along the strip between Stratosphere and Mandalay Bay. Strip & Downtown Express provides limited stop service on most part of the Las Vegas Strip. This route can be especially crowded. Full buses can pass stops if no one onboard requests stop. Service extends south from Mandalay Bay to South Strip Transfer Terminal between 12:30am and 9am. During daytime, take Strip & Downtown Express. Operates south of Mandalay Bay between 12:30am - 9:00am only. This page was last edited on 10 September 2018, at 21:12.